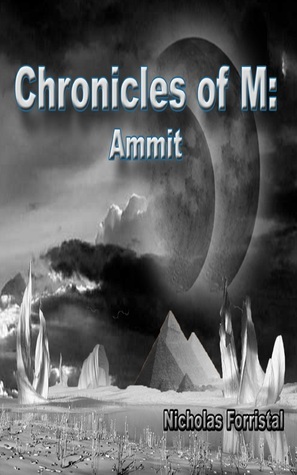 Ammit is the second book of author Nicholas Forristal’s Chronicles of M series. We pick up almost exactly where book one ended: with Samuel Horn and Thomas trying to find a way to expel the demon from M.
M is a superhero, one that has had a demon in him for over 40 years and now he is loosing the battle against the demon. Samuel has an odd power, he can tell people to do something and they do it. Two weeks ago he did not even know he could do it but after seeing that he can control M he realizes that he may be the only person that can keep M under control until they can find a way to expel the demon from him. Thomas is M’s oldest and probably only friend. He owns a government agency that is a secret from the public. is a desperate race to find him before the demon that has taken over begins to kill. I did not realize how much I missed M until I started reading this book. I really enjoyed the first book and M has to be my favorite character of the whole series. He was angry, cussing, and sarcastic and overall he truly was a ticking time bomb just waiting to go off. I could not help but love him. Samuel actually is not in this book much. He is only in the first half. Ammit is mostly focused on Thomas’ point of view and his past, M’s POV, Dixie’s and we also have a new character that we get some POV from. The swapping of points of view is not hard to follow, Forristal transitions through them flawlessly and I was never once left confused about who was talking. Thomas is actually the more important character in this second book I think, where Samuel was in the spotlight for book one (it of course all revolves around M, though). But we learn a lot about Thomas’ past, where he came from and how everything that is going on right now is connected to him. We are left with a lot of questions and plot for future books and I cannot wait to read them! The biggest question I have right now has to be is if Samuel is coming back, though. Overall, I really liked Ammit. It was darkly funny at times, the characters are very three dimensional and the plot itself is very unique and interesting. I had no problem throwing myself in this book and losing track of time. This is a series I think you definitely have to read in order. They are too connected not to be read in order without wondering what you may be missing that happened in book one, but I recommend this book to anyone that has read and liked the first book. I would recommend the series to anyone looking for looking for a great read.